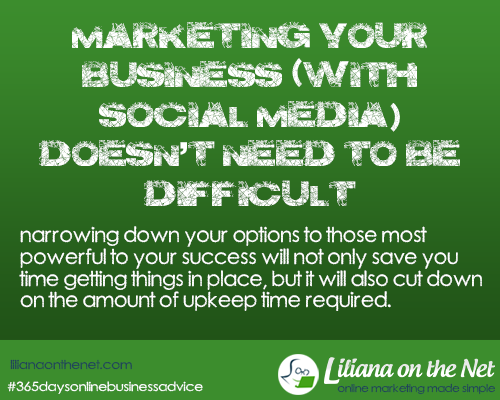 Getting your business up and running with social media doesn’t need to be a difficult process. Narrowing down your options to those most powerful to your success will not only save you time getting things in place, but it will also cut down on the amount of upkeep time required. Of course, I have an advantage because I have the wonderful product that my friend Sue Worthington, a Social Media Expert released last year. PLUS take a peek behind the scenes of the accounts of a Social Media professional – discover the tools and strategies that are proven to work in today’s market place. We all use Social Media but most of us use it for connecting with friends, and attempt to use it for business but usually get it very wrong. Visit the above and read the wonderful reviews of people that have been in the challenges. So there you are you don’t need to miss out in promoting your business in Social Media. My advice is to start slowly, concentrate in one, at the moment Facebook seems to be the most popular but according to Sue, Google+ is the Social Media Site to be in 2014 and she knows! You had me at your headline! : ) I passionately agree and was just having this conversation yesterday with a new client. There are a great many wonderful Social Media options out there, but that doesn’t mean we need to be on all of them. I, too, am streamlining my social media involvement to only those channels that have given me value. I choose LinkedIn, FB and Twitter for biz. Pinterest and Instagram for fun so that I don’t get bored or burned out. thanks for the advice! Happy New Year! As a Journalism and Mass Communication student I appreciate your tips on how to build an online brand via social media. Many businesses are under the impression that all recent college graduates are equipped to handle and expand corporate social media accounts, and that is not the case. Honing social media skills takes time and proper training. Each platform attracts a different type of user, and it is important to format your message for each individual profile. Great advice! Oh my goodness Liliana, what a wonderful post you have written – I am honoured – really! In today’s business environment, using social media is essential. listen and apply what she teaches! I love Sue, her products and her challenges, but I won’t be participating in all of them this year. I need to focus on product creation! Give Sue my best and have fun with her challenges! Bonnie Gean recently posted…What Would You Do With More Money? Good luck with her FB challenge. I did that one last year and it rocked! I agree that I think Google+ is going to be much friendlier than facebook to bloggers but I’m on facebook all the time because that is where most of my groups are–I love Pinterest!!!! I don’t spend much time on there anymore–too busy, but I get a lot of views from what I’ve pinned. Great post! You are so right that Social Media doesn’t have to be difficult. I have been in Sue’s challenge and they are really good! Thanks! Wendy Bottrell recently posted…Benefits Of Exercise For Women – What To Do About It!